Escape the summer heat! Aspen, Colorado beckons you in the summer with a list of endless activities (hiking, biking, rafting, golfing, horseback riding, kayaking/canoeing and shopping). There's an adventure suitable for every fitness and skill level. We will be staying at the famous Gant condos, our home away from home. The Upper Roaring Fork was named Thunder River by Ute Indians to describe the rumbling sound the river makes in early spring. This intermediate raft trip is great for all levels and is easily accessible, as the put-in is only 15 minutes outside of Aspen. This section features beautiful scenery and wildlife. Enjoy some of Colorado’s best Class III whitewater on rapids, such as Toothache, Barking Dog, and later in the season Member’s Hole. Trip departs at 8:30 AM and returns by 12:30PM. Cost: $104.00 adult. What Should I Wear? We recommend that you wear a bathing suit as your base layer. We will provide rafting jackets, pants and a wet suit, if necessary. We have neoprene booties available or you can wear shoes that will stay on your feet and can get wet (flip flops are not appropriate). Bring dry clothes for the ride home. What Should I Bring? We suggest the disposable, waterproof type cameras. Pictures will be taken from the shore and will be available for purchase. By now you have probably been told that no visit to Aspen is complete without a trip to see the Maroon Bells. Known as “the most photographed peaks in North America” this view is certain to take your breath away. Today we will break into small groups, based on fitness and adventure levels, and head to Maroon Lake to take photos of the iconic Bells. After we have soaked in the scenery, we will head out on the hiking trail that best suits your group. We are lucky to have access to a variety of trails that include mostly uphill terrain, mostly downhill terrain, and a popular out and back hike to Crater Lake. Total time spent on the trail is approximately 2 hours. Trip departs at 8:30 AM and returns by 12:30PM. Cost: $104.00 adult. Panoramic views of the entire Roaring Fork Valley highlight this trip, as we head high up Aspen Mountain to an elevation of 12,000 feet. As soon as we leave the Gant, we being our ascent, winding up roads that you may recognize as ski runs if you have visited us in the winter months. Once on top, we will traverse Richmond Ridge before descending down the backside of Aspen Mountain. Along the way we will pass old silver mines rich in history. Once we get back on to Castle Creek Road, we will head to the ghost town of Ashcroft. This scenic ghost town was once larger than Aspen itself during the height of the mining boom. Trip departs at 8:30 AM and returns by 12:30 PM. Cost $104.00 adult. What Should I Wear? Always dress in layers. Most trips will reach elevations in excess of 11,000 feet where it will be cooler. A sweatshirt or jacket is recommended even on warm days. What Should I Bring? Sunglasses, sunscreen, camera and a hat are recommended. A gentle horseback ride for a short getaway that is equally fun and scenic!! Enjoy great views of the Elk Mountain Range and the scenic White River National Forest that surrounds Aspen. Sit back and relax, as gentle trail horses show you the way, meandering through aspen groves and colorful fields. A great way to experience the Colorado wilderness and western heritage. All horses are trail horses, which are gentle in nature and used to mellow trail rides. No galloping, trotting or cantering is allowed on this ride. Trip departs at 8:30 AM and returns by 12:30 PM. Cost $185.00 per person. This trip covers the ground that once held the railroad track that came into Aspen. The trail is a smooth dirt double track that follows the picturesque Roaring Fork River. From start to finish there is an elevation drop, but it is so gradual that you would think the trail is flat. We will end at The Woody Creek Tavern - a local’s favorite - a small bar with a large amount of character. Once the favorite hangout of Hunter S. Thompson and other famous locals that want to stay out of the Aspen spotlight. This roadhouse grill is certainly unique. You will have a hard time leaving but will appreciate the van ride back. Trip departs at 8:30 AM and returns by 12:30 PM. Cost: $110.00 adult. Cost does not include any food or beverage at the Woody Creek Tavern. What should I Wear? Comfortable clothes. On warm, sunny days we recommend shorts, T-shirt, and tennis shoes. On cool days we recommend a sweater or light jacket. We provide rain jackets on wet days. What should I bring? You won’t need much in personal gear, and we provide all of your equipment. Sunglasses and sunscreen are recommended. We provide a bike pack to carry cameras. Class III Whitewater Rafting on the Upper Roaring Fork: The Upper Roaring Fork was named Thunder River by Ute Indians to describe the rumbling sound the river makes in early spring. This intermediate raft trip is great for all levels and is easily accessible, as the put-in is only 15 minutes outside of Aspen. This section features beautiful scenery and wildlife. Enjoy some of Colorado’s best Class III whitewater on rapids, such as Toothache, Barking Dog, and later in the season Member’s Hole. Trip departs at 8:30 AM and returns by 12:30PM. By now you have probably been told that no visit to Aspen is complete without a trip to see the Maroon Bells. Known as “the most photographed peaks in North America” this view is certain to take your breath away. Today we will break into small groups, based on fitness and adventure levels, and head to Maroon Lake to take photos of the iconic Bells. After we have soaked in the scenery, we will head out on the hiking trail that best suits your group. We are lucky to have access to a variety of trails that include mostly uphill terrain, mostly downhill terrain, and a popular out and back hike to Crater Lake. Total time spent on the trail is approximately 2 hours. Trip departs at 8:30 AM and returns by 12:30PM. Jeep Tour in the White River National Forest: Panoramic views of the entire Roaring Fork Valley highlight this trip, as we head high up Aspen Mountain to an elevation of 12,000 feet. As soon as we leave the Gant, we being our ascent, winding up roads that you may recognize as ski runs if you have visited us in the winter months. Once on top, we will traverse Richmond Ridge before descending down the backside of Aspen Mountain. Along the way we will pass old silver mines rich in history. Once we get back on to Castle Creek Road, we will head to the ghost town of Ashcroft. This scenic ghost town was once larger than Aspen itself during the height of the mining boom. Trip departs at 8:30 AM and returns by 12:30 PM. Horseback Ride in the White River National Forest: A gentle horseback ride for a short getaway that is equally fun and scenic!! 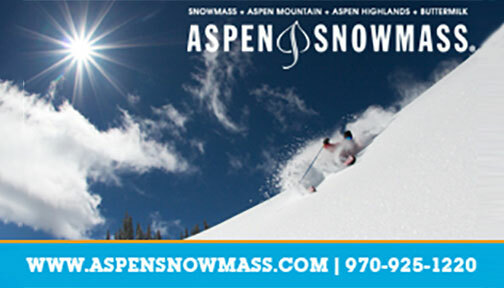 Enjoy great views of the Elk Mountain Range and the scenic White River National Forest that surrounds Aspen. Sit back and relax, as gentle trail horses show you the way, meandering through aspen groves and colorful fields. A great way to experience the Colorado wilderness and western heritage. All horses are trail horses, which are gentle in nature and used to mellow trail rides. No galloping, trotting or cantering is allowed on this ride. Trip departs at 8:30 AM and returns by 12:30 PM. FRIDAY, JULY 14th Cruiser Bike Ride to Woody Creek Tavern: This trip covers the ground that once held the railroad track that came into Aspen. The trail is a smooth dirt double track that follows the picturesque Roaring Fork River. From start to finish there is an elevation drop, but it is so gradual that you would think the trail is flat. We will end at The Woody Creek Tavern - a local’s favorite - a small bar with a large amount of character. Once the favorite hangout of Hunter S. Thompson and other famous locals that want to stay out of the Aspen spotlight. This roadhouse grill is certainly unique. You will have a hard time leaving but will appreciate the van ride back. Trip departs at 8:30 AM and returns by 12:30 PM. Cost does not include any food or beverage at the Woody Creek Tavern. The cost of the 3B3B is $18 a night more expensive for a total of $108 for the 6 nights.